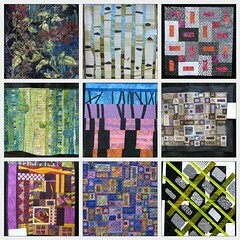 Yesterday I biked to Amherst to join friends for lunch and the Hands Across the Valley Quilt Show. The lunch was fabulous, even though I was having one of those scrimmagy days where, although nothing goes horribly wrong, a series of small things are not quite right. I forgot a bike lock, couldn’t wedge the bike into a friend’s trunk, knocked the chain off the gears and wound up (finally) at lunch greasy and sweaty and disgruntled. Except everything was fine after that! Lunch was great and the quilt show was pretty spectacular. The piece I was finishing over the weekend is melting overnight. I used some meltable stabilizer, and it is insufficiently melted, and needs a good soak. Then it needs to dry. The whole process is taking far longer than I expected. I am going to go be horizontal. I rode the red horse in the woods and got lost, and finally got home an hour later than I meant to. Then I rode the other two for good measure, and then I had to go clean my teacher’s barn. It was a little colder than I was wanting, but I was prepared, and just fine. Even getting lost in the woods wasn’t bad, just frustrating. I love to look back through my bookmarks and favorites and see themes. That is where my inspiration mosaics come from — a sudden realization that, “Oh. Look. I have a bunch of quilts with circles.” or whatever. I’m so glad you put them together this way. Quite lovely.